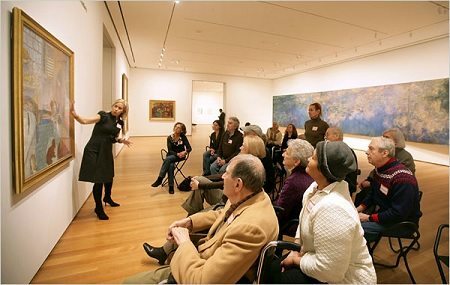 Art museums and galleries are increasingly working with local chapters of the national Alzheimer’s Association and similar organizations to develop programs that target people with mild cognitive impairment (MCI) and early stages of dementia. An article in the Atlanta Journal-Constitution cites four programs in Georgia—two in Atlanta, one in Augusta, and one in Cartersville—which represent a trend inspired by the pioneering “Meet Me” program at the Museum of Modern Art (MoMa) in New York. That program, funded by the MetLife Foundation from 2007-2014, yielded useful insights and best practices that other museums can learn from. Put another way, “Art has a way of bringing you back,” says Julie Green, senior manager of school programs at Emory University’s Michael C. Carlos Museum, which offers “Museum Moments” for people with early memory loss and their caregivers. The program includes a free tour with a specially trained docent. The pace is slow and the scope limited to avoid overwhelming the participants and to allow them time to respond to individual works of art. Nonprofits Will Care for an Aging America, but Under What Workforce Conditions? It is increasingly clear that the U.S. is inadequately prepared to care for its growing number of elders and people living with disabilities, and one of the major issues for nonprofits in those fields is the ways in which the direct care workforce is treated and compensated.